“This is an election, not a coronation,” said Adewumi. The debate was riddled with arguments over whether each candidate has produced “tangible” results within the student body. Adewumi argued that while Ragland and Smith have a considerable amount of experience in their involvement with numerous organizations and initiatives, they have failed to produce palpable results for the student population. 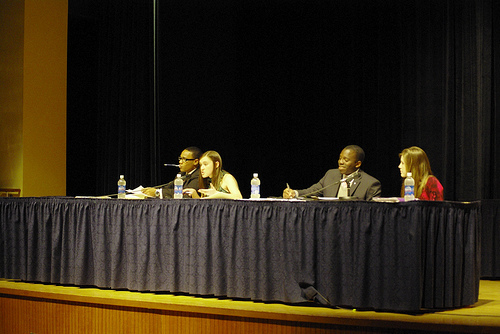 After referencing the stack of Daily Collegian articles documenting Ragland’s achievements that Adewumi had brought with him, Ragland stated that he has in fact produced numerous tangible results, including his work to raise awareness of sexual assault against women, the Academic Affairs Committees’ online book exchange, and his experience with UPAC and the UPUA. While Ragland respects Adewumi’s outside experience, he asked what Adewumi has done for the student body that has produced said ‘tangible’ results, a word used a little too often throughout the night. When asked what direction each candidate would take with regards to some of the broader initiatives that the UPUA has brought forth this year and the more specific programs like the White-Loop extension, Ragland stated that it is important to produce ‘tangible’ results for the student body, such as their current platform plans to expand Wi-Fi on campus, set up off-campus housing seminars, increase the amount of blue emergency phones on campus, and subsidize classes and tests for entrance to graduate levels. He reiterated, however, that it was also important to work on the long-term goals in order to be an effective executive board. Throughout the night, Adewumi attacked numerous Ragland-Smith proposals, in particular their plans to increase printing jobs for students on campus. He stated that he had talked to the IT department and he was shown “reams of data” that suggest that it is neither ecological nor economical to increase the number of printing jobs for students, something Ragland-Smith had wanted to do in response to the students’ wishes. Adewumi also said that the Ragland-Smith Pennsylvania Student Association was “completely impractical,” because it banked on recruiting students from other schools across the state, most of whom already receive a large portion of their student appropriations and thus would be less likely to participate in such a coalition. The bottom line here seemed to be both platforms’ inability to produce any ‘tangible’ change within the student body in their combined years of experience within their respective organizations. And while Adewumi’s main argument was just that, he himself lacks any sort of ‘tangible’ products in his years here at Penn State and thus doesn’t quite hold any weight in his accusations. Needless to say, it will be interesting to see who the student body votes for come Wednesday. I was born in Virginia Beach, raised in Westfield, NJ, went to college at Penn State, moved to Miami, FL. Peruvian on mom's side and English on my Dad's. I'm a Journalism major and Political Science minor. I do not currently own any reptiles. The 2010 midterm elections are today, and if you’re voting, which you should be, you’re probably going to need help deciding which candidates you choose when you go to the polls today between classes.